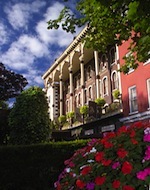 Saratoga Springs may be best known for its horse racing and hot springs, but this picturesque upstate New York town of 27,000 residents (although that number swells to about 100,000 during the summer race season) has qualities that make it a terrific spot for a romantic weekend getaway all year long. To start, it’s less than three hours by car from both New York City and Boston (with a setting just north of Albany). But Saratoga Springs’ major appeal is its indisputable charm – 19th-century buildings line its main shopping street (Broadway – shown above), 18 natural mineral springs dot its leafy landscape, and pretty parks, historic buildings, and monuments abound (the pivotal Battle of Saratoga during the Revolutionary War happened here). There’s also a world-class performing arts center, museums devoted to automobiles and dance, a casino, and more than 100 restaurants. I’m just back from a visit, so here are some highlights for couples looking for a small-town escape that also offers style and sophistication. What to Do: Located in the 2,000-acre Saratoga Spa State Park (shown at right), the newly renovated Roosevelt Baths & Spa is part of the red-brick Gideon Putnam Spa Resort complex, built in 1935 as “America’s First European Spa.” While a renovation has given the lobby and relaxation area a contemporary feel, the long tiled corridors and sterile hydrotherapy rooms will seriouslyremind you of scenes from The Road to Wellville. Go with the flow and indulge in a 20-minute mineral bath ($20 per person). Don’t be put off by the vintage tub or rusty hue of the effervescent, mineral-rich, 97-degree water – you’ll float a bit and emerge feeling relaxed and refreshed. 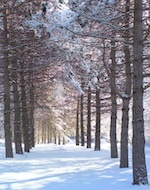 Tack on a 60-minute couples massage ($200 per couple), offered by excellent therapists trained in therapeutic massage. 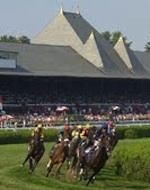 The racing season at the Saratoga Race Course lasts just six weeks (in 2012, from July 20 until Labor Day, with races daily, except on Tuesdays), but it epitomizes the classic Saratoga experience. The track (shown at left) dates to 1863 and is the oldest continually operating thoroughbred racetrack in the country (admission is $3). The nearby Saratoga Casino & Raceway features harness racing (from March to November) and a gaming facility with over 1,700 slot machines, as well as dining and entertainment options. 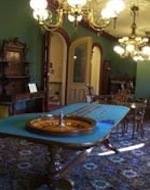 The small but fascinating Saratoga Springs History Museum, which occupies the upper floors of the landmark Canfield Casino – a circa-1870 building in Congress Park that was once the gambling grounds of late 19th-century high rollers – is a must for history buffs and amateur ghost hunters. Its six exhibits set on three floors showcase the city’s history via vintage furniture and signs, Victorian-era clothing, and photographs. You may recognize it from the SyFy series Ghost Hunters, which filmed a segment here in 2010 – and if you are lucky (or unlucky, depending on your point of view) you might just feel the chilled air and hear the creepy footsteps of late 19th-century resident Rubena, who is said to walk between one room that holds her bed and belongings and a parlor across the hall. Oh, and the roulette wheel in the High Rollers room (shown at right, above), is also known to spin on its own. Admission is $5. Where to Stay: The key to enjoying Saratoga’s historic streets is to stay in the heart of downtown. Depending on your budget, here are a few great options: The Hampton Inn & Suites – Saratoga Springs is the city’s newest hotel. Designed with lots of wood and welcoming yellow and green Craftsman-inspired décor, its 123 rooms (shown at left) are spacious with king-size beds, flat-screen TVs, and free WiFi. 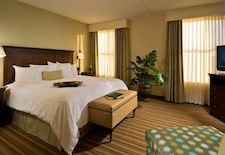 Rates start from $111/night, including breakfast. The Saratoga Arms is a family-run inn located on Broadway in a Second Empire-style brick building with a picturesque veranda that dates to 1870. 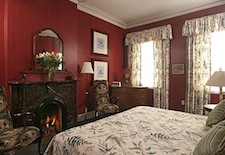 It has 31 rooms, some with fireplaces and Jacuzzis, that are comfortably modern, but feature pretty period details (shown at right) – and the cooked-to-order breakfasts (included in the rate) are delicious. 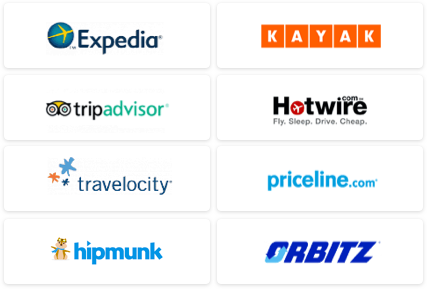 Nightly rates start from $210. I didn’t stay here, but lovers of all things Victorian might opt for The Batcheller Mansion Inn, a circa-1873 jewel box of a mansion located on the far side of Congress Park, where you should splurge on one of the three deluxe rooms named for members of the home’s original residents, the Batcheller family. Rates start from $220/night. Where to Eat & Drink: Saratoga’s 100-plus restaurants (among the most per capita in the country) offer a wide array of cuisines and dining experiences. After your treatment at Roosevelt Baths & Spa, head over to Putnam’s at the Gideon Putnam, where both the burger and the Spa Club (smoked salmon, sliced egg, sun-dried tomato, and caper spread) were fantastic; don't miss the original wall murals, hand-painted in 1939. 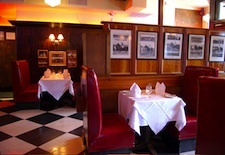 For a bit of Saratoga tradition, book a table at Sperry’s (shown at left), where since 1932 locals have been enjoying classics like hangar steak au poivre and roasted duck breast with brandied wild huckleberry demi-glaze, all now updated by master chef Dale Miller (from $125 for two). Before dinner, drop by Max London’s for their daily happy hour (3pm to 6pm for 2-for-1 house cocktails, wines by the glass, and draft beer), while the adjacent Mrs. London’s bakery serves up an amazing array of buttery pastries and decadent desserts. Post-dinner, head to The Wine Bar for 45 wines by the glass and live piano music (on Fridays and Saturdays) or barhop along Caroline Street and Phila Street, home to classic college-crowd hangouts the Tin ‘n’ Lint, Saratoga’s oldest saloon, and Café Lenna, the oldest continually operating coffeehouse in the country. Seasonal Calendar: Winter can be a cozy time to visit Saratoga Springs and there are still a few weeks left to enjoy the holiday lights and do some shopping along Broadway, which is home to an eclectic mix of shops and galleries, including Lucia, for unique women’s clothing, jewelry, and accessories; and Saratoga Olive Oil Co., for dozens of international olive oils, balsamic vinegars and salts – many flavored and all available for taste-testing. Visit on February 4, 2012, to enjoy Chowder Fest, an annual daylong celebration of all things chowder, with about 70 eateries serving up $1 samples of their unique and creative recipes. February 23 through February 25, meanwhile, sees the culmination of Beer Week, celebrating beer and food pairings. Spring signals the city’s emergence from its semi-hibernation as its parks and historic streets fill with blossoms (shown at right). Summer is the star season with a packed schedule (including jazz concerts, performances by the New York City Ballet, and the annual wine and food festival) at the Saratoga Performing Arts Center and, of course, horse racing. Fall is a wonderful time to visit with the foliage in full color and the annual Fall Festival downtown. 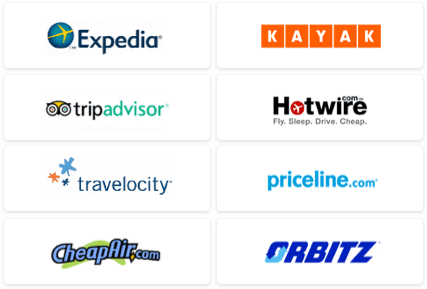 Use our Travel Search price comparison tool to find the lowest rate on flights, hotels, packages, and more travel deals.